From our research we have found that these rather rare and interesting pots were commissioned and designed to grow tomatoes in. Submersing the pots a few inches beneath compost, means that the drainage holes allow roots to escape out in search of moisture in the surrounding compost, reducing watering and acting more like ring culture. 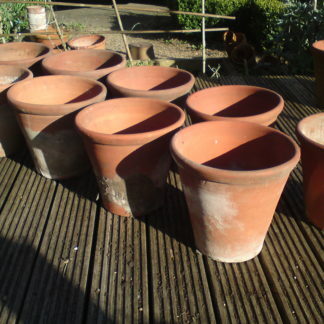 Even if you don’t plan on using them in this way, these pots are beautiful, rare and interesting and any larger patio plant would look superb in them. PLEASE NOTE : If you would like to purchase these pots, please get in touch first to discuss postage.